Beyond the encoding and decoding operation of the poems, they can be read as examples of recognised experimentally based procedures. The use of portmanteau words, ellipses, and neologisms is particularly evident in this collection. [...] Blonstein's acknowledgement of the hermeneutical possibilities of non-lineal reading is to be welcomed. Anne Blonstein [...] is skilful in the deploying of other texts within the poetry of the blue pearl. [Her] major theme throughout the collection is the relationship between shard and artefact, actual gap and imagined completeness - these borrowed elements remain discrete. What does bind them together is a sculptural sense of placing on the page; and, although at times it can make the work seem rather obviously structured, at its best it creates a vibrant tessellation, wholly fitting the content to the form. Anne Blonstein's notariqon is distinctive in two ways: it is most unusual to find the encrypted words in a different language from the language of those 'on screen'. This needs a special term, and we might settle for 'hetero-notariqon'. The practice raises our uncertainty yet another notch, for we can now suppose that we could look for words in any language we happen to know, or in which we might recognize words, whether or not we understand them. The second distinctive feature of the notariqon in this volume is that the disclosed verb is the title of a painting. Poems about paintings (or other visual representations) are generally treated under the topic of ekphrasis. Ekphrasis is a rhetorical practice of putting into words what is depicted, and of rendering a plastic, spatial work of art in a temporal sequence. To conceal the fact that these poems are ekphrastic, and to hide the title of the image, is to hide the pictorial, to encrypt the ekphrastic: to en- the ek-; and to render the verbal, linguistic title invisible by arranging it to be received not temporally - as words usually are - but spatially, as if it were an image. 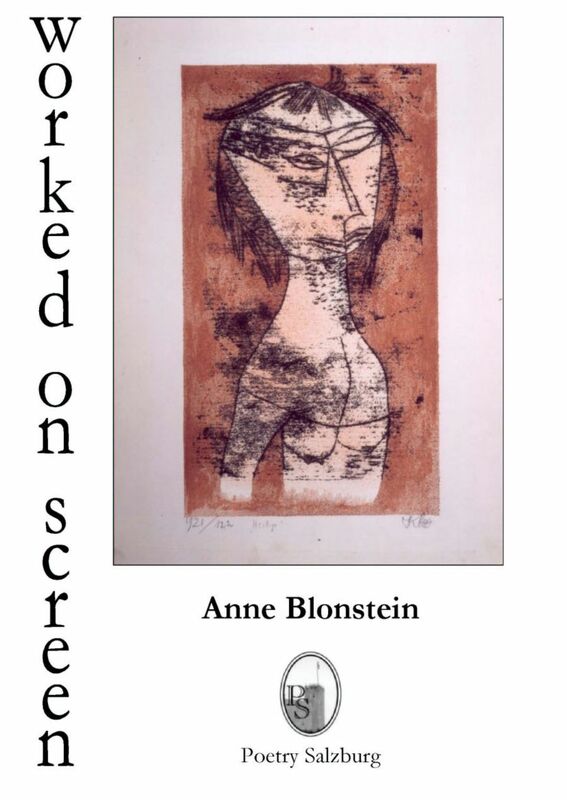 I have attempted to describe Anne Blonstein's craft as contrascription: a way of writing that does not aim for clarity, consistency or conclusion. Contra-scription instructs its readers in the complexities of writing, alerts us to the presence of unexpected messages and unbidden guests: to signals at odds with each other, criss-crossing, zigzagging, resisting the semantic seductions of the straight line. Linear reading is the fundamental deception by which our logo-centric culture maintains its voice and its authority. In every line lies a lie. Contra-scription teaches us to look askance and aslant, aft and fore, to treat the page as a screen on which nothing is, as it appears to be, fixed: eye and ear must continue to work on screen. For no matter how worked, nor worked however hard, what has been worked on screen will never submit to the writer's authority. There will be plenty of messages found here, apart from those deliberately encrypted. For it may be texts above all - and below all - that are still visited by angels. Anne Blonstein is above all a poet who inhabits and is inhabited by more than one language (one poem has three stanzas, one in English, one in French, one in German, each a reformulation of the others; it is interesting to see that French is the language most resistant to any syntactic deconstruction!). Like anyone who functions on a daily basis in more than one language, using more than one language in one's poems is never a wilful exclusion of a unilingual readership but rather the necessary and often desperate search of a person who feels encaged in any single linguistic system, which lops essential dimensions off his or her own being and in so doing reduces their capacity for expression. No doubt this multilingual background has also enabled Bronstein to embark more readily on the tremendous linguistic adventure with the English language which awaits the reader of WORKED ON SCREEN. Blonstein's poetry creates a network of correspondences with writers and artists across genres, language, time and space while accepting constraint. To interact with Blonstein's notarikon makes one more reflexive about the materiality of words and more susceptible to their shades - from pleasure to pain. Kathrin Schaeppi, "Anne Blonstein's worked on screen: Notarikon as poetic interpretive process and intimate involvement with the word". Interim 26:1-2 (2008), 271-74.